With the summer tourist traffic at its peak, thousands of tourists moving in and out of here are taking back bitter memories of traffic jams and bumpy rides, which have become routine on the Kulu-Manali National Highway-21. The aborted exercise to delimit Parliament and Assembly constituencies, which caused a political turmoil in the hill state in 2002, is again likely to spark off a bitter controversy if the preliminary proposals discussed at a meeting of the delimitation commission held in New Delhi on Monday are any indication. The Leader of Opposition and former Chief Minister, Mr Prem Kumar Dhumal, today held the district administration responsible for the acid attack on May 27 and the backlash that followed. Army Public School here has become one of the few schools to introduce virtual classrooms for offering satellite-based educational facilities to its students. A Very Small Aperture Terminal Network (V-SAT) link has been established at the school for the purpose. 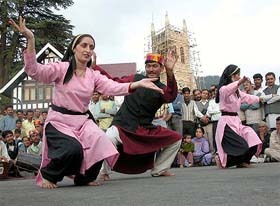 Students of Army Public School perform a folk dance during the institute’s 19th founder’s day in Dagshai on Wednesday. Due to inordinate delay in issuing a notification regarding inclusion of new areas in the Town and Country Planning Act of the town, there has been a spurt of haphazard construction activity in the peripheral areas of Dharamsala. Bulk consumers will no longer be dependent on the State Electricity Board for power with the Himachal Pradesh State Regulatory Commission putting the “open access” regulations in place. Even as the Ministry of Rural Development has shot down the plea of the Solan Forest Division to fund the regeneration of the bamboo forest area the division has turned to various agencies to arrange funds for process. Mr Ram Lal Thakur, Forest Minister, has underlined the need for the scientific removal of khair trees. He said that withholding of felling of these trees beyond the maturity stage was encouraging their illicit felling besides loss in quality with the passage of time as the khair heart wood started rotting. The district police has sounded a high alert in the region with the main accused in Monday’s looting incident turning out to be a Muslim youth who was impersonating as Babli Mann and residing in Subathu. The Himachal Pradesh High Court has banned political activities or such other activities in the local Rani Jhansi Park (popularly known as Ladies Park. The government has banned fishing from today till July 31 in any reservoir, including Gobind Sagar, rivers, khuds and ponds, in Himachal Pradesh excepting the cold-water regions of Lahaul-Spiti, Kinnaur, Kulu and Manali where trout fishing is very popular among foreign tourists who visit these areas during these summer months. Himachal Governor VS Kokje today met former Prime Minister Atal Bihari Vajpayee at Prini near here. It was a courtesy call. Mr Kokje also visited visually-impaired children at the children home at Kulu before he came here. Mr Kokje praised the NGO helping the children learn computer. 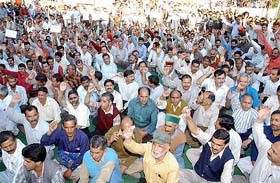 Employees of banks, insurance companies, Central Government departments and state public sector undertakings today held a joint rally in protest against the imposition of professional tax. Indira Gandhi Medical College, Shimla, will be linked with the PGI through the telemedicine project soon, Chief Parliamentary Secretary, Ms Anita Verma, said here today. Worsening the plight of tourists and local residents is the fact that the Irrigation and Public Health Department has dug up roads in Manali town and parts of Kulu town, where traffic jams have become the order of the day. Tourists have to brave not only bumpy rides on the highway till Manali on a narrow and potholed road, but they also face danger from falling boulders on two stretches between Patli Kuhal and Alu Gudam. The CPWD and the municipal councils in Kulu and Manali share the blame as they have not been able to clear debris and repair roads, resulting in a harrowing time for the tourists. Even tourists have forwarded written complaints to the district tourism authorities as the roads in the hill stations are narrow and the traffic police untrained and thinly placed. But it has all fallen on deaf ears, say hoteliers. In Kulu town, the national highway from Akhara Bazar and other areas is full of heaps of debris and dust. The roads are narrow and the tourist traffic comes to a standstill daily for hours, rue the residents. The national highway between Kulu and Raison is singlelane and pot-holed, causing a lot of heartburn among the tourists who get struck in jams. “We have advised the IPH Department not to dig up roads during the tourist season as it will add to the traffic congestion, but it did not listen to us”, said Mr Gautam Thakur, president, Hoteliers Association Manali. At Chandertal hotel, run by the HPTDC, the sewerage water flows on the road, creating unhygienic conditions. “It is a bitter experience here this time, as the roads are in a bad condition”, said Rajesh and Anurag Kapur, tourists from Jalandhar. The president of the Nagar Parishad, Manali, Mr Praveen Fakay, said they had advised the IPH officials to complete the sewerage work by April 15, but neither the IPH Department nor the national highway authorities listened to them. “The sewerage project is going on for the last two years”, he added. The IPH Superintending Engineer, Kulu, Mr I.S. Chandel, said the sewerage project was time-bound and it would be completed soon as per a high court order. “We give funds to the PWD to repair the roads,” he added. “We have cleared the debris on almost all stretches on the highway. We are widening the single lane into a double lane. The tarring work is in progress between Kulu and Manali”, claimed an executive engineer, national highway. The exercise, which was deferred on the eve of the Assembly elections, has been resumed and this time it is being carried out on the basis of the population figures of the 2001 census. Earlier, the commission had based its proposals on the 1991 census data. The commission will hold another meeting before finalising the base paper. It will be circulated among associate members for a threadbare discussion in the full commission. According to reliable sources, the most drastic changes are being proposed in Shimla district. While Rohru, the constituency of the Chief Minister, Mr Virbhadra Singh, is proposed to be reserved, the neighbouring Jubbal-Kotkhai segment is to be scrapped .The Kotkhai area is to be merged into Kumarsain and the Jubbal area into Chopal. The Kasumpati (SC) segment will be dereserved and split to carve out a new segment in place of Jubbal-Kotkhai. The new constituencies will be named as Kasumpati (urban) and Kasumpati (rural).The Sunni area will made part of the Kasumpati (rural). The Shimla parliamentary constituency (SC) is proposed to be deserved and in its place Mandi, which is represented by Mrs Pratibha Singh, wife of the Chief Minister, is proposed to be reserved. The Karsog segment is proposed to be dereserved and in its place Chachiot is to be reserved. The draft paper circulated by the commission in 2002 also included this proposal, but it was rejected in the meeting of the full commission subsequently. In Kangra district, where the 2002 delimitation proposals caused a vertical divide in the ruling BJP, the number of constituencies is to be reduced from 16 to 15. The Thural segment is proposed to be abolished. In the earlier proposal. the Sulah constituency of a former Chief Minister, Mr Shanta Kumar, was to be abolished. The number of constituencies in Kulu district is to be increased from three to four by carving out a new segment of Manali. The Banikhet segment in Chamba district is proposed to be renamed as Dalhousie and reserved. In Solan district, the Arki segment is proposed to be reserved. During the earlier exercise, Solan was to be reserved. The number of constituencies reserved for the4 Scheduled Castes is to be increased from the existing 16 to 17. The distribution of population has not shown any appreciable change over the 1991- 2001 period. The Leader of Opposition and former Chief Minister, Mr Prem Kumar Dhumal, today held the district administration responsible for the acid attack on May 27 and the backlash that followed. He demanded that the DC of Mandi be transferred to restone the confidence of the local residents as he had failed to control the law and order situation in the district. Addressing a press conference here before he left for Kulu to attend the state executive meeting in the evening, Mr Dhumal said that had the DC been in the town in time and controlled the law and order situation, violence and other incidents would not have occurred. “The DC was in the Muradevi mela and he did not act swiftly to bring the law and order situation under control”, he alleged. Mr Dhumal, who was accompanied by Mr Suresh Bhardwaj, state BJP chief, a former Forest Minister, Mr Roop Singh Thakur, said that the DC had issued ration cards to the outsiders out of way, which should be probed. “The outsiders, as it happened in the acid attack case in the local bus here, are involved in most crimes in the district. In Karsog, a person from UP kidnapped a minor girl last month, which was rescued by the police later”, he alleged. Charging the Congress government with protecting the inept DCs, Mr Dhumal, who also visited acid attack victims, alleged that the increasing incidents of crime in the state had hit tourism. The government far from protecting the local residents was protecting the DC to shield the culprits. The false cases of arson and rioting were being made against local residents, alleged Mr Suresh Bhardwaj. The CMO, Mandi, said that only three acid attack patients was in the hospital under treatment and were improving fast. Stating this at the institute’s 19th founder’s day, the school Principal, Col A.K. Maini (retd), said this facility would open up a world of knowledge for the students and also help them prepare for competitive examinations. Addressing students, their parents and the faculty, General Officer Commanding 2 Corps, Lieut-Gen K.D.S. Shekhawat, who was the chief guest on the occasion, said children were the hope of the nation and the essential ingredients of national power. “All children have a major role to play if national power has to come into prominence,” he remarked. Towards this end, he exhorted students to strive for excellence in whatever field they chose. He stressed upon inculcation of discipline, professionalism and secularism in their lives. He also urged teachers to strive for creating a healthy environment for students which was free of tension and worry. In his report, Colonel Maini stated that this year 69 students appeared for the Class XII examinations and bagged a total of 104 distinctions. In Class X, 51 students appeared and bagged 80 distinctions. The Principal, however, added that there was scope for improvement in chemistry, economics and mathematics. The school has bagged a host of prizes in state and national level sports and co-curricular activities. General Shekhawat announced a grant of Rs 50,000 for upgrading facilities at the school. He also gave away prizes to students for their achievements in academics and co-curricular activities. The sports trophy was bagged by Patel House, while the athletics trophy went to Tagore House. The best kept house trophy and the best disciplined house trophy went to Indira and Subhash houses, respectively, while the academics trophy was bagged by Nehru House. Vandana Singh of Class XII was declared as the best allround student for the year 2004-05. Students were also given prizes for individual performance. 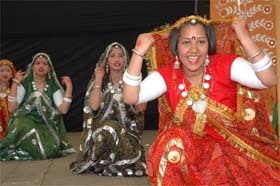 A cultural programme consisting of songs, dances and an English play was presented by the students. A science, art and craft exhibition was put up in which models and works of art prepared by students during the year were displayed. More than 100 buildings have come up in the Sheela Chowk area, besides the Regional Centre of Himachal Pradesh University and a Tibetan monastery coming up in Khaniara, all falling outside the planning areas, leading to unregulated construction activity. Sources in the Town and Country Planning Department added that the massive construction activity in the entire Naddi area was unregulated as it was yet to be brought under the Act. The proposal to include 20 rural estates, falling in the peripheral areas of Dharamsala under the Town and Country Planning Act was sent to the state government in 2002 but it is yet to be notified. This has also delayed preparation of a complete development plan by including these areas along with the existing Dharamsala Municipal Committee and 12 villages. A population of nearly 30,000 in the areas of Sidhbari, Rakkar, Mohli, Tapovan, Banwala, Naddi and up to Yol cantonment is proposed to be brought under the Act. Once this happens, the construction activity will be monitored and the residents will get the benefit of the various urban development schemes like the sewerage schemes, road networking and check on encroachments. An official said the population of these areas was apprehensive about the notification as most of them confused the Town and Country Planning Act with the Municipal Act. “We recently received a notification from the Skoh panchayat pointing out that their electricity bills would shoot up and they would even have to pay tax on keeping a pet dog,” he said. A delegation of women from the Chamunda area also met the Deputy Commissioner and complained that their cost of living would become unaffordable after the notification was issued, ignorant of the fact that they would actually get better civic amenities, added the official. Meanwhile, the revised development plan of Dharamsala is also pending for scrutiny and once approved by a special committee, it would be put up before the Cabinet for a final go-ahead. It will enable the big industrial units and other bulk consumers to get their requirement of power from outside the state. While the open access in transmission has been thrown open fully, it has been introduced in a phased manner in distribution. In the first phase, consumers with a contract demand of 5 MVA and above will be allowed open access from June 10, 2005. The consumers with contract demand between 2 MVA and 5 MVA will have open access from April 1, 2006, and all consumers with a demand in excess of 1 MVA will be allowed the facility from April 1, 2007. The Central Electricity Regulatory Commission had already notified the regulations for open access in inter-state transmission. With the framing of regulations by the SERC, open access in both transmission and distribution has become operational in the hill state. The open access consumers have been categorised into long-term, short-term and captive generators based on the use of transmission and distribution system. The State Transmission Utility and the State Load Dispatch Centre will be the nodal agency for arranging long-term and short-term open access, respectively. The application fee for long-term open access in transmission will be Rs 1,00,000 and for short term open access Rs 5,000. The fee for long-term and short-term open access in case of distribution has been fixed at Rs 50,000 and Rs 5,000, respectively. The consumers will be required to pay transmission charges ,wheeling charges and surcharge for open access. The commission has also framed rules for recovery of expenditure for supply of electricity. The distribution licensee will recover the cost of service line and the terminal and metering arrangement on the premises of the consumers in case of low-tension supply, which requires laying of service line from the existing distributing mains. Under existing rules, service line up to 30 m was provided free of cost. In case a new transformer, extension of 11 kv, 22 kv, low-tension line is required for providing supply, the licensee will recover the full cost from the applicant but the amount paid in excess of the payable cost will be refunded as and when new connections are given from the transformer and lines on a prorata basis with 8 per cent interest compounded annually. The balance cost recoverable from the subsequent applicants will be continuously reflected in the bills of the consumers who paid the excess amount. The plea to lend financial support has already been made to the District Rural Development Agency (DRDA), the Ministry of Environment and Forest, the National Mission of Bamboo Application and the Himalayan Forestry Research Institute at Shimla, informed Mr Alok Nagar, DFO, Solan division. A sum of Rs 2.50 crore is required to facilitate the regeneration of bamboo forest in division. Over 900-hectare area of Solan division is under bamboo cultivation. The flowering in the bamboo forest has taken place on a largescale this time. The last time the flowering in bamboo forest had taken place in 1959. There was a urgent need to protect the scattering of seeds in the bamboo forest area livestock, maintained Mr Nagar. A round-the-clock vigil, besides fencing of the area, was required to protect the regeneration process of bamboo, he asserted. The bamboo shoots usually sprout from seeds in the rainy season and it was high time to take care of growing shoots, he said. The flowering was noticed in January. To reduce incidents of fire efforts were on to remove the dried bamboo shorts from the area with the help of the Forest Corporation, said Mr Nagar. Mr Thakur was presiding over a two-day meeting of Conservators of Forests, which commenced here today. He suggested that the case for seeking the approval of the central empowered committee for commencing the felling of khair be separated from the main proposal and the need for the removal of trees scientifically be forcefully presented before the Central empowered committee. The minister stressed that the experience gained by Uttaranchal in the field of cultivation and propagation of medicinal herbs be utilised in the state. The responsibility of conservation of medicinal herbs should have been with the Forest Department. He stressed that a policy be formulated for the propagation of herbs in the state. Mr Thakur suggested that the Yuvak Mandals and Mahila Mandals be involved in setting up nurseries to raise quality planting stock. He assured that matter for the direct recruitment of forest rangers and forest guards would be taken up with the Finance Department. He also assured that the funds for compensatory afforestation and catchment area treatment (CAT) plan would not be a problem in future. The district police has sounded a high alert in the region with the main accused in Monday’s looting incident turning out to be a Muslim youth who was impersonating as Babli Mann and residing in Subathu. The police alert assumes significance as Subathu is a cantonment area where the 14 Gorkha Training Centre is located. The youth, it is learnt, is Hyder Ali a resident of Fatehgarh in Punjab. He was residing in the house of Narinder Singla as a domestic help for the past three years as Babli Mann. Police officials said his antecedents were being verified. It was learnt that he had been booked in a case registered on August 30, 2002, under Section 354 of the IPC for outraging the modesty of a woman in Subathu. He was on bail. The court had recently issued a notice to his lawyer for forfeiting his surety amount of Rs 2,000 as he was not traceable. He had presented himself to be a resident of Ropar and son of Lakhwinder Mann before the court. Police investigations, however, revealed that he was Hyder Ali son of Muhammad Ali and a resident of Khand Manpur in Fatehgarh in Punjab. A police team has been despatched to trace him. Meanwhile Baddi police has detained two youths, Noor Muhammad and Naseeb Rehmaan, his brothers, who were running a sweet shop. The police is investigating whether they were accompanying Hyder Ali when he looted the house of Narinder Singla on Monday. The Himachal Pradesh High Court has banned political activities or such other activities in the local Rani Jhansi Park (popularly known as Ladies Park. A Division Bench comprising Chief Justice V.K. Gupta and Mr Justice K.C. Sood observed that the park ultimately would be developed for amusement, entertainment and relaxation of the public at large, the tourists as well as the local residents, and carrying out of such activities would defeat the very purpose of this park. The order was passed on a public interest litigation (PIL) wherein direction was sought to develop the park for better use of the park. The Commissioner of the Shimla Municipal Corporation stated in his affidavit that final conceptual drawings of the Ladies Park were with the Chief Architect of the state and steps would be taken to expedite the completion of formalities at the earliest. An official spokesman said there today that fish lay eggs during these two months as this was their hatching season in warm waters and fishing, if allowed, during these months would destroy fish. There are about 4,500 fishermen families who are dependent on fishing for their livelihood. The Department of Fishing takes stringent measures to ensure that illegal fishing during these months is not allowed as this has been made a cognizable offence during these months and the offender, if caught can be sent to jail for six months and can also be fined up to Rs 5,000. Mr Vajpayee and Kokje spent a few minutes with each other. Mr Vajpayee spent the whole day at his residence with his family members. Mr Prem Kumar Dhumal, former CM and Mr Shanta Kumar, a former Union Minister today attended the state BJP’s executive committee meeting at Kulu. Various speakers condemned various policies of the Virbhadra Singh government and warned him that he would have to pay a heavy price for these like his predecessor, Prem Kumar Dhumal. They maintained that there was no justification for imposing such a tax and if the government needed resources, it should cut down on wasteful expenditure and reduce the size of the ministry. Indira Gandhi Medical College (IGMC), Shimla, will be linked with the PGI through the telemedicine project soon, Chief Parliamentary Secretary, Ms Anita Verma, said here today.